The National Garden Clubs organization recently recognized the Delaware Federation of Garden Clubs with an Award of Excellence for the group’s ‘TREE-mendous Delaware’ tree planting at the Delaware Botanic Gardens. Arni’s President’s Project for the DFGC’s “TREE-mendous Delaware” tree planting at the Delaware Botanic Gardens was given the Award of Excellence by the National Garden Clubs. As part of the project, for every $100 raised or donated, a native flowering tree will be planted in the woodlands of the Delaware Botanic Gardens. Those who donate $100 will be given a certificate from the DFGC in honor of, or in memory of, a loved one, family member or whomever they choose. Arni said the project follows the national group’s theme. So far, the DFGC has given out more than 100 certificates through TREE-mendous Delaware. “Which is tremendous!” said Arni. “The reason we won the award is that this project embraces all that National Garden Clubs is about, which is raising funds to plant trees that the public will view and will be pleasurable to them — not just for this generation but multi-generation. I don’t know why it caught on… I expected to have about 25 trees in the first year, and we have 100. The DFGC also received a first-place award for its TREE-mendous Delaware Membership Growth. “We still have until next April for this project. It’s really taken off. Plus, we’ve added two new clubs — one in the Ocean View area and one in Bridgeville, and they’ve been growing,” she said, noting that in the first nine months of the project, DFGC grew 4 percent, with an overall goal of a 10 percent increase. The national convention at which the awards were presented was held in Philadelphia, Pa., on May 23. 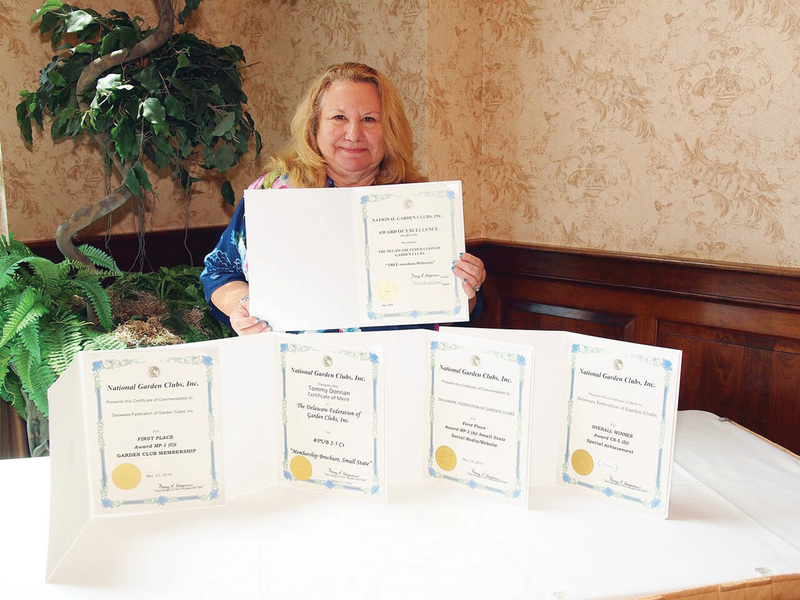 The DFGC also received a first-place award in Small-State Social Media Website (run by webmaster Margaret Woda) and an award of merit for its membership brochure, and individual clubs also received awards as well. Along with the certificates, the DFGC also received an engraved medallion. Not only did the DFGC sweep the national awards, but in April the organization celebrated its 60th-anniversary Diamond Jubilee. Arni said she’s excited to see what the club does in the next year and beyond, noting that she hopes more garden lovers consider joining an area club. For more information about Delaware garden clubs, or to become a member, visit www.DelawareGardenClubs.org or call Alva, membership chairwoman, at (302) 841-3632.